First things first, what is a down payment on a home? A down payment is a portion of the total home sale price paid to the seller. The remaining portion is the money you borrow with a mortgage loan. For example, if the home price is $200,000 and you decide to pay a 10 percent down payment, your down payment will be $20,000 and the remaining $180,000 will be covered by your mortgage loan. Your down payment and mortgage loan will vary depending on your credit history, loan type and loan terms. Why do home buyers need to pay a down payment? It helps offset the risk lenders take by loaning you the money for your mortgage. The less you borrow, the less risk to the lender in losing money if payments cannot be made. This is also why home buyers who pay less than a 20 percent down payment usually need to pay private mortgage insurance (PMI) with a conventional loan or mortgage insurance premiums (MIP) with an FHA loan. Where can I get the money for a down payment? The money for a down payment can come from your own savings, the money you get when you sell a house, or gifts and grants from family, employers and nonprofits. When will I need to pay my down payment? When you’re sitting at the closing table. Typically it will be paid with an “official check” from a bank. It is a fact the more you put down, the lower your monthly mortgage payment, and the less you owe the bank. Also, if it’s at least 20 percent down, you save the PMI cost on a conventional loan. However, if putting 20 percent down cleans out your savings and leaves you without financial reserves, it may not be the best option for you. FHA loans are a lower down payment option. FHA home loans allow buyers to pay as little as 3.5 percent of the home purchase price as a down payment. This type of loan is also a good option for home buyers with lower credit scores. Home buyers can technically qualify for an FHA loan with a credit score of 580 or higher, according to HUD. This is a great option for home buyers who do not have a significant amount of cash for a down payment. These loans carry private mortgage insurance, but it goes by a different name: mortgage insurance premiums (MIP). MIP includes two premiums. You have an upfront premium that can be rolled into your mortgage or paid at closing, and a monthly premium that is included as part of your mortgage payment. What about the Freddie Mac 3 percent down payment option? In 2018, Freddie Mac began offering conventional mortgages with down payment options as low as 3 percent to help qualified first-time home buyers and low-to-moderate income home buyers. You will pay more monthly, but this is a legitimate option for some home buyers. This range is more common these days, especially with first-time home buyers. If this is what you can afford, then you may want to look at whether an FHA loan is a good option for you. 5-10 percent down still reduces the amount borrowed from the bank. You will need to pay PMI or MIP depending on the loan type. However if you choose a conventional loan, once you build 20 percent equity in your home, you can cancel your PMI payments. This option is not available with an FHA loan. Here are two examples for a $200,000 priced home with a 3% down payment versus a 20% down payment. 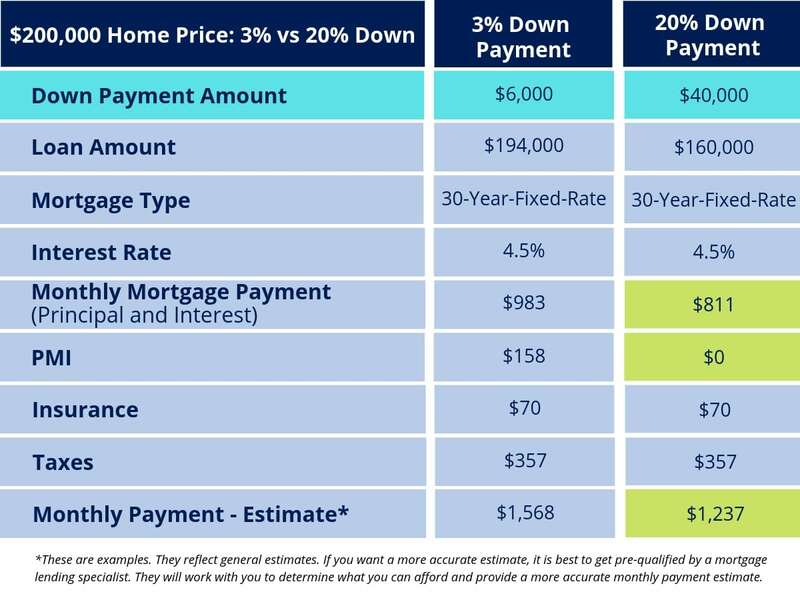 Notice the different down payment amounts in light blue, and the 20 percent down payment money savings shown in green. What About NO Down Payment Options? The Department of Veterans Affairs guarantees VA loan mortgages with no required down payment for qualified veterans, active duty service members and some members of the National Guard and Reserves. There is no mortgage insurance cost, and often the interest rates are lower. The Rural Development mortgage guarantee from USDA is a no money down option that is not limited to farm land. However, you must meet their eligibility requirements. For example, there are geographical limits, household income restrictions, and it is primarily intended for first-time home buyers. If you qualify for either of these types of no down payment loans, you should know you can use these loans in conjunction with Homes for Heroes and save much more money by working with our local specialists. What is earnest money? The purpose of earnest money is to serve as a good faith deposit to the seller. It helps to show the seller you’re committed to buying the home and honoring the real estate purchase contract. If you enter a contract with a seller, the earnest money also serves as “liquidated damages” that the seller keeps if you breach the contract. Sellers will rarely accept an offer without an earnest money deposit. When is earnest money due? Generally, earnest money is due after your offer is accepted by the seller, and you have both signed the purchase agreement. At this time, you will give your earnest money deposit to the title company (or real estate broker in some states) who will hold the funds in an escrow account until the home sale is in the final stages. Never give the money directly to the seller. If everything goes as outlined in the purchase agreement, the earnest money is released from escrow and applied to your down payment and closing costs. How much is generally accepted as an earnest money deposit? We must inform you that your local market probably has a standard acceptable amount for an earnest money deposits, however, generally speaking it’s between 1-5% of the home purchase price. It can be as high as 10 percent. Generally speaking, to give you the best opportunity of landing the house you want, it’s wise to have five percent of the purchase price available in your checking account before you begin making offers on homes. However, do not let this discourage you. Sellers often accept lower earnest deposit amounts. Five percent is a “better-safe-than-sorry” recommendation, especially in a competitive market. At a minimum, you should have one percent set aside. Your real estate agent will be the best source for an acceptable amount. Can I get my earnest money deposit back? If the deal does not happen, there will be a cancellation fee taken out of your earnest money deposit, and the rest stays in escrow. Whoever holds the deposit decides if you get the money back based on the terms of the purchase agreement. What does “closing” mean? If this is your first run at buying a home, “closing” is the point in time when the title (official document of ownership) of the property you’re purchasing is transferred from the seller to you. What are closing costs? Closing costs for a buyer are fees associated with the purchase of your home and they are paid at the closing of your real estate transaction. Closing costs are generally 2-5 percent of the total purchase price of the house. So if your new home costs $200,000 your closing costs would likely land between $4,000 – $10,000. The fees that make up your closing costs vary widely due to where you live, the home you buy, and the type of loan you choose. Here is a list of home closing costs that you may need to pay for your real estate transaction. There are times when the seller will agree to pay some or all of the closing costs, but that is on a case by case basis you can discuss with your team. Your team of real estate and lending professionals should keep you informed of everything you are responsible to pay at closing, and provide you with a checklist of everything you will need to bring to your closing. To pay your closing costs, you will likely need a cashiers check or “official check” signed by a bank. Moving is a big deal. You’re basically uprooting your life. Whether you are moving thousand of miles away or two blocks down the road, it still takes time, money and planning. The kicker about moving costs is they often end up being more than you anticipated (or hoped). Bottom line, it is expensive. It’s often an exciting time to be moving into a new home. So, do yourself a favor and use the information below to plan the amount of time, people and money it will take to make your move a good one. If you need to hire a moving company, do not cut corners to save a buck. Movers are expensive for a reason. You pay for high quality of service, and how they take care of your belongings. Good movers will not damage your things. If an accident happens (and they do happen), good movers will fix it. According to the American Moving & Storage Association, if you hire professional movers for a relocation, you can expect to pay at least $1,000. 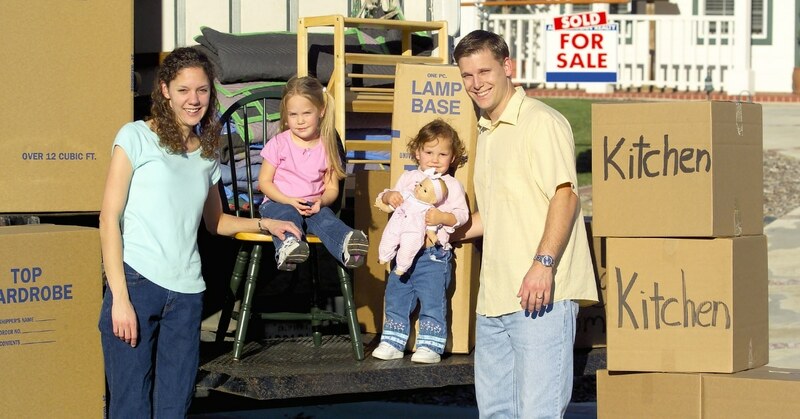 They say the average cost of a local household move is $2,300, and the average cost of a long distance move is $4,300. Your moving costs will depend on many factors like distance traveled, weight of belongings, moving date, labor costs and any other services or materials. Be sure to check out Homes for Heroes Local Deals to see if we have a moving specialist in your area who is committed to reducing the cost of their services for heroes like you. If you plan to do the moving work yourself, there is no insurance to cover damages, but you will save the hefty cost of hiring professionals. Sometimes friends, family, pizza and beer are the best moving plan and cost saving option. If your moving plan includes packing yourself, don’t forget that you’ll need to purchase supplies like bubble wrap, boxes, and tape. What if you sell your current house before you buy a new house? Or, what if your move takes longer than planned because your house closing is delayed? You may need to store some of your items in a storage unit. The cost of a self-storage unit can range from roughly $100 – $200 per unit, depending on if the unit is climate-controlled. Many pet owners choose not to put their beloved family member through the stress and anxiety of moving, especially if the pet is older, so they may end up boarding their animal overnight. Depending on where you take your pet, boarding can be expensive. Another option is to leave them with a friend or family member who is good with your pet. Maybe you do not plan to have the time or energy to unpack and set up beds, nor do you want to sleep on the floor, so staying in a hotel is a great option. There’s a cost, but a good night sleep to prep for all the unpacking and organizing that will be necessary the days to follow, may outweigh the cost. These are unavoidable costs. You will need to set up certain services for your new home, and you will need to shut down some services for your old residence. Most homes will need electric, gas, garbage and recycling, water and sewage, cable, internet, phone and possibly security services. Many factors play into the cost of cancelling and setting up these services. It is best to call ahead and find out before you move. These are a few to keep in mind as you plan things out. You can also minimize some of these costs by buying used or shopping around for the best deals. If you are currently renting an apartment or some other rental property, you probably paid a deposit upfront before moving into your unit. If you want that deposit back when you move out, you will need to clean and fix up your unit so it looks like it did when you moved in. The longer your move drags out, the more you may pay. Unforeseen things can happen. Natural disasters can hit at anytime and cause damage to your existing house, or your new home. Regardless, it may delay your closing. These unforeseen costs can include repairs or extended storage unit rental costs. Keep a little in your reserves to handle any unexpected costs. People often forget when they move to a new space with a different floor plan, or simply a bigger space, is they’ll need to fill that space with furniture appropriate for their new floor plan. Maybe you now have more bedrooms or a finished basement that need to be furnished. Maybe your old stuff just doesn’t feel right in your new place and it’s time to update or upgrade some things. Maybe you want to start fresh with a new washer and dryer, or replace the carpet. Regardless of what it is, most new homes need some new stuff. When buying a home, the little costs can add up. Whether it’s paying for movers, utility deposits, or transfer fees, moving is expensive. That doesn’t include any renovation costs or other improvements you want to make before settling into your new home. Homes for Heroes can help you save on these costs. Our heroes save an average of $2,400 when they work with our specialists. When you buy a home with Homes for Heroes, you will receive a Hero Rewards® savings check after closing that you can use to purchase what you need for your new home. Simply sign up to speak with our local specialist. There’s no obligation. They are honored to work with heroes like you, to help you to find the home your want, and save you significant money in the process. Making room in your budget for the cost of the move will help avoid unpleasant surprises and make the experience less stressful and more enjoyable as you begin life in your new home.